This pdf is 30 pages long, 1 page front cover, 1 page editorial, 1 page SRD, 2 pages of advertisement, leaving us with 10 pages of content, so let’s take a look! Manuals – from bonuses to attributes to unique abilities, they are an often coveted item – and yet one that is not that represented among supplements. This pdf aims to change that – framed by the trademark, nice narration we’ve come to expect from Rite Publishing supplements, this pdf provides us with new manuals to grant permanent benefits to the readers – but only once per manual. The respective manuals feature the market prices, requirements for constructing the respective books as well as a short description how the respective book looks like. Now, beyond offering 30 manuals, we actually get 3 variants for the respective manuals, totaling 90 manuals – elementary, advanced and expert versions, all with different results. Each manual requires a set amount of hours of study over the course of a limited amount of days to gain the respective book’s benefits. It should furthermore be mentioned, that the respective manuals offer sometimes multiple benefits: Take for example the rather basic “Being Comfortable in your Armor”-series of manuals: Studying the book nets you light, medium or heavy armor proficiency respectively. If, however, you already are proficient with the respective class of armor covered by the manual, you’ll increase your max dex bonus by +1 (light armor)to +3 (heavy armor) reduce armor check penalty by 1 to 3 to a minimum of -1 as well as decrease arcane spell failure chance for the respective class of armors by 5% per class of manual – the one on heavy armor reduces the spell failure chance in heavy armor by 15%. Not all books are linear progressions of benefits, though: Oracles may want to study “Answers to Universal Enigmas” – the book requires you to have a certain amount of oracle-levels. The elementary version nets you 1 skill rank in two skills of the oracle’s mystery-list, whereas the advanced version of the manual makes the oracle count as +1 level with regards to two of his/her revelations. The expert version of the book grants an additional revelation and the option to cast 2 spells from his/her bonus spell list 1/day. Channeling energy, knowledge, weapon proficiencies, bombs, favored enemies, disguising, raging, unarmed strikes, diplomacy, acrobatics, perception, wizardly spellcasting, improved summoning, stealth and bardic performance, sleight of hand, movement rate, teamwork, domain powers, druidic casting & knowledge nature, improvised weapons, sorceror bloodlines, witch hexes, sneak attack, survival and using magical devices make up the topics for the other manuals herein, just to give you an impression whether the topics relevant to your interests are covered. Editing and formatting are very good, I didn’t notice any significant glitches. Layout adheres to RiP’s 2-column b/w rune-covered standard and the pdf features stock-b/w-artwork that does its job. The pdf is fully bookmarked. 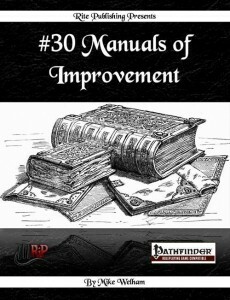 Mike Welham delivers a great, useful little supplement and one that begs for a sequel – after all magi, gunslingers, samurai, ninjas or renegade classes could benefit as well from manuals like this. That being said, one minor gripe I have with this pdf would be that here and there the writing could be slightly more concise: Take aforementioned example of armor-proficiency granting manuals, which includes the sentence “If the character already has this feat, he increases his maximum Dex bonus by 1, reduces his armor check penalty by 1 (to a minimum of -1), and reduces his spell failure chance by 5% when wearing light armor.” (pg. 3) While it is clear that the maximum dex-bonus allowed by the armor is meant, it could be misread as granting a +1 to dex-bonuses in general. Nitpicky, yes, but I I encountered minor ambiguities like this here and there, which remains my only true gripe with this pdf – content-wise and rules-wise, this supplement is solid and thus, I will settle for a final verdict of 4.5 stars, rounded down to 4 for the purpose of this platform. Want to skip through these manuals? Here you go!